COMMUNICATION by coyotes is one of my passionate interests, just as is their family life and social interactions. What I write here is based entirely on my own eleven years of hearing and documenting coyotes in their natural settings and in context. Coyote communication occurs mostly via eye contact, facial expressions and body language and it can be very subtle. Coyotes are not forever vocal as humans are; they tend to be on the quiet side — except when they aren’t! I’m including a number of vocalization videos for you to hear. By carefully observing the contexts in which any vocalization occurs and knowing different coyote positions and relationships in the family, we can figure out why they were emitted and what meaning they have for other coyotes. Their sounds do not constitute “a definite language” per-se, but consist more of emotional output — emotings — which can be easily read by other coyotes and by those of us who spend time listening to them in situ as they go about their social activities. Coyotes have intense family lives, so it’s the interpersonal communication/vocalizations which predominate. Family internal affairs are much more all-consuming than anything else going on in the ‘outside world’ for them: family life is what they live for. And each coyote — and by extension each coyote family — has its own unique variation on the general themes. Yipping, howling, and any other vocalizations may be heard at any time of day or night — this is because coyotes themselves are diurnal animals, meaning they can be active at any time during a 24-hour day. How far off do you think you can hear a howl? I investigated this question in the post by that name — just click on it to read it. By the way, I have not encountered coyotes howling for no reason at all, and I have not encountered coyotes howling before or after a kill — yips and howling appear not to be an indication of an eminent attack on prey nor a celebration thereof. Coyote “songs” can last for 20 minutes or longer. VARIETY OF SOUNDS. Coyotes are always doing something, and always communicating. Once you are aware of what is going on, you have a better chance of understanding any vocalizations. The sounds appear to fall along two continuums: one raspy and one sing-songy. The raspy ones range from barks, growls, grunts (these sometimes precede an agitated barking session), gnarls and snarls, through hisses and huffs or exhalations. These span from loud and clear to barely audible whispers and they generally tend to have an angry, dominating or warning intent. The other continuum is more sing-songy, ranging from dissonant cacophonies to violin-pure single high-note howls to low-pitched soulful mournful howls, to screams, yips, yelps, whines, squeaks and squeals. These also span from loud and clear calls, to the barely audible childlike high-pitched tones at greetings which sound as though produced by very tiny puppies, though they are made by adults. I think the sing-songy variety generally have more of a let’s-get-along, unity, or complaining intent. Screams can actually go either way. Many vocalizations incorporate a multitude of these sounds. Older males seem to have a slightly lower tonal range than the others of those I know. Within their sing-songy yips and howls, they are able to produce a variety of tones, pitches, modulations, inflections — sometimes with warbles, lilts, crescendos and trills. They use their mouths, lips (at the sides) and tongues in addition to their vocal chords. The unique pattern combinations, lengths and use of these various articulations, can form signature howls for individual coyotes. In addition, their voices are probably as individually different as our own. They can be identified this way by other family members. Among the coyotes I know, I can distinguish who is howling in the distance because I’ve learned their individual howl patterns. We don’t have terms for all of the sounds they emit as far as I know, and since they run in a continuum, and mostly meld together, it might be hard to break them down into exact discrete descriptive terms. Eskimos have 50 or so terms for snow to differentiate very relevant differences that they need to know. Further south on the continent, our terms for snow are limited to what is relevant to us: powder, icy, slush, new, wet, dry. The same might be said of coyote noises: barks, growls, howls and yips are the terms most of us apply to coyotes. However, there is much more that is relevant for them, and the examples below dip into this a little. Context is important — it determines the meaning of any vocalizations. Why do coyotes yip, bark, or howl? What are the types of things they communicate verbally (remember that most communication is quiet and through body language)? Warnings, hellos, happiness, joy, anger, distress disapproval, dislike, pain, their whereabouts are some of the things they express out-loud. I’ve heard a dad start yipping, apparently calling to his family, and then two of his pups respond but not the others. The two that responded had been close-by. They ran towards him and then all of them started yipping together — there had been no siren, and the other two family members — his mate and another adult pup — were not involved. The area I have not had experience with is voice communication between individuals from different families. I know these individuals challenge each other vocally and respond to the challenges, and they even physically fight. I’ve seen the result of such a fight but I did not hear the vocalizations. If and when I do hear this, I will elaborate on it here. If anyone else has heard it and would like to comment about it, please do!! 2 Social communication. 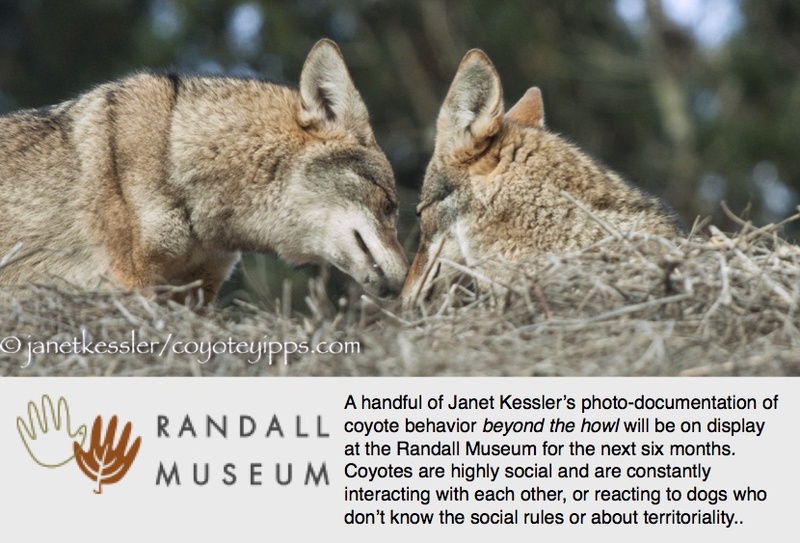 The social communication in recordings #8 and #9 may, at first, sound a bit harsh due only to the coyote’s proximity to the microphone — but you’ll see that it is a peaceful communication with a gentle intention in its back-and-forth flow. Since here they precede a get-together before the evening activities, the immediate message is probably about that: “Hey, I’m ready” or “I’m coming”, and conveys their proximity to each other. Beyond that, the simple act of communicating confirms their unity as a pair, their well-being, and no doubt more about their mundane situation. It also (speculating again) may serve as a territorial message proclaiming ownership of the turf to other coyotes further off but within earshot, as explained above. 3 Distressed howling and barking due to intrusive dogs. This barking is intense. It happens as frequently as ‘howling with the sirens’ in the parks where I observe. Howling and yipping which results from having been chased by a dog is easy to recognize because it is very distressed and anguished sounding. An unusual example of this is a three-year old loner I’ve been documenting: She regularly screams at, and follows, the dog who used to chase her — she does this to no other dogs, no matter how often they’ve chased her. That dog no longer chases her because she is kept leashed. The coyote appears to be aware that the dog is restrained. This behavior has gone on for over half a year, diminishing somewhat lately. The coyote appears to be standing up for herself and possibly for her territorial claim, against this dog who harassed her, even though a human is there, and even though the dog is about 100 pounds. I used to think that the barking and howling which occurred after a dog chase might be a warning to other coyotes in the family group, but I have seen instances where this was definitely not the case. For example, a dominant coyote — the mother — was relaxing on a hilltop when one of her full-grown pups started a barking session not too far off — it had been disturbed by a dog. I immediately started watching for a change in the mother’s behavior, waiting for some type of reaction. There was none. This mother ignored the barking, even though I had previously seen her run to a pup’s defense when she saw a dog — a particular dog which she deemed dangerous — approach too close to one of the pups. In another case, I was on a hillside photographing one of these full-grown pups when I heard the mother barking in distress in the distance — it is a signature bark which I have come to recognize. The young coyote totally ignored the barking and continued its hunt! Here, the yelps were not an alarm signal to others. This is what made me realize that vocalizations were emotive responses. I’ve observed that coyotes are feeling animals if nothing else: hear more about this from Carl Safina. 1) & 2) &3) A coyote’s distressed yelps due to the intrusion of a dog. This type of intense vocalization occurs when a coyote is anguished and upset. The first two videos show the exact same response by 2 different coyotes to the same situation, showing how different coyotes and their communication might be. 4) & 5) & 5a) & 5b) Here are a couple of responses to sirens. High pitched yips can sound as though they are puppy noises, but they are adult vocalizations. All sorts of sounds, including grunts, barks and gnarls are woven into both. In the second video, a coyote who is not in view responds from the distance by baying. 6) Soulful baying is a more unusual response to sirens and here melds into a back and forth communication with another coyote. 7) & 8) A family responds to sirens in the distance which morphs into shorter greeting yips in a rendezvous. 9) A 4-month old youngster responds to his family in the distance. 10) & 11) Long-distance social communication between a mated pair. The first takes place during a calm afternoon: more details about this video can be read above under “social communication.” The second video is more intense, at night, with the male barking in the foreground, and the female, sounding agitated further away. 12), 13) & 14) Hisses and growls are depicted in these three videos. In the first, soft anger hisses/growls are used to say “get away from me”. In the second video, hissing and “almost” growling at a youngster imparts that Mom does not want any nonsense — pup acquiesces. In the third video, the female of a mated pair is trying to impose her will on her mate (apparently trying to keep him from grooming a youngster) who responds by moving away from her. 15) Growling and snarling accompany shoving and biting, while the youngster squeals of pain in this video depicting disciplinary and dispersal behavior . 16) This recording begins as a family response to a siren. Then at about 1:36, as greetings and rank confirmations begin to take place, a youngster growls at another and THAT coyote is then pursued by two others who threaten her for her disruptive growl. She squeals as a preventative measure as they approach, warding off a possible bite from them! 17) & 18) I’ve included two more videos to show how coyotes use mouth and lip movements in their vocalizations, and even tongue movements. 19) To howl or not to howl is an indecisive wavering I see repeatedly: there is grunting which sometimes precedes a barking episode, as if the coyote were trying to decide whether or not to go ahead with it. 20) Multi-tasking! After stealing the dead rat and playing with it, he walks off, intending to bury it where only he can find it. But sirens and howling from others begins and distracts him. So he multi-tasks: howling with the rat in his mouth. But not for long, the rat is more important. He goes to bury it, but again gets distracted: family activities win out, and the rat is abandoned. 21) & 22) Some howling can be pretty relaxed. In this first video a female is responding to her mate’s call while lying down: note her single high-pitched tone vs. her mate’s barking. In the second video, rank issues and annoyance are dealt with along with howling..
23) This coyote is following, and giving a tongue-lashing, to the dog who chased her long ago. She behaves this way towards this dog and no other. She is both angry at, and fearful of that dog as seen by her posture. She follows them (dog and owner) for maybe a football field’s length, sometimes complaining like in this video and sometimes not, then sits and watches them disappear over the horizon. Owner and leashed dog just keep walking on and away from her and, fortunately, are rather amused by the coyote’s behavior. This behavior has been going on for over half a year now. 25) This lugubrious howl occurred after the male coyote went about an unusual frantic sniffing of his territory. He was following someone’s scent. Right after the recording he “kicked” the ground: he was angry. The day after the recording, I spotted an intruder female in his territory. So this howl is either a warning or an emission of internal discontent — the same as when coyotes howl after having been chased by a dog. Any chance you can help me with the meanings behind these coyote sounds that I routinely hear after every train blows its horn near Water Works Park in Cuyahoga Falls, Ohio? In the video above, what I’m most concerned with is the loud scream that comes in during the third set of howls. I often hear this specific coyote in the pack and wonder if he has something wrong, if it’s a specific vocalization of his, or if it’s just his voice in general. He’s one of the primary reasons I took such an interest in this exact pack above others. He sounds very unique. Plus, I’ve been a railroad fan for 15-20 years, going out day and night, and have never come across another spot where they go nuts at the train horns like this. It’s incredible. In the video above, there are a number of different audio clips. At 1:17 and 2:19, do you know what kind of vocalization that is? It almost sounds like a cry, and if I’m not mistaken, it’s the same coyote who makes the screaming sound in the video above. At 3:54 (it’s real quiet so you’ll have to listen closely), you again hear the screaming (almost moaning) sound. I’m really, really fascinated by this coyote and want to know what his deal is. I’ve never heard a coyote sound like that one before.When I first discovered these guys at Water Works Park, he happened to be the very first coyote I heard make any sound. Naturally I was a bit freaked out, because he doesn’t even sound like a member of the canidae family at first listen. I thought it was a human or goat lol. Any help is VERY appreciated. Nobody seems to have answers to this. I have roughly 60 audio recordings of this exact pack of coyotes, and even more questions than what’s here, but I won’t bombard you. Thank you very much for the timely reply and information. It does indeed help. I wish I could tell you more about this pack’s physiology and behavior, but unfortunately in the dozens upon dozens of times I’ve been here to get recordings, I’ve NEVER been able to see them. They’re only active at night, and are in a portion of the park that is fenced-off as a part of the town’s water supply. I have heard their sounds come from different directions outside of this restricted area, but it is always from deep within the woods at a very dark hour. Finding them has been a monumental challenge for me, but I keep trying because I really would like photos. By chance, do you have an email that I could message you at? I figure that may be easier than communicating back and forth on here. Plus, I’d like to share with you some more of my recordings, findings, and discoveries with this pack to get your opinion (as long as you don’t mind). I appreciate it all. Thanks much. Incredibly insightful! My dog and I have encountered a coyote almost daily on our walk for months now. The vocalizations are very similar to the “disressed by a dog” audio you have provided. The animal usually shows itself as a means to attract the dog’s attention for a chase. This usually happens close to where my dog flushed out 3 pups this spring. The pups weren’t harmed but I wonder if this is still a parent on guard? Thank you for providing the benefit of your learning – it’s nice to learn more about our wild neighbours! Hi Laura — Yes, the coyote is upset and wants your dog to stay away from that area. It might be a good idea, if you can and are willing, to leash your dog in that particular area and walk way, way around it? You could experiment to find out what distance stops producing the barking?? Yes – we’ll respect its space – thank you.